Cinnamon spice and all things nice……. 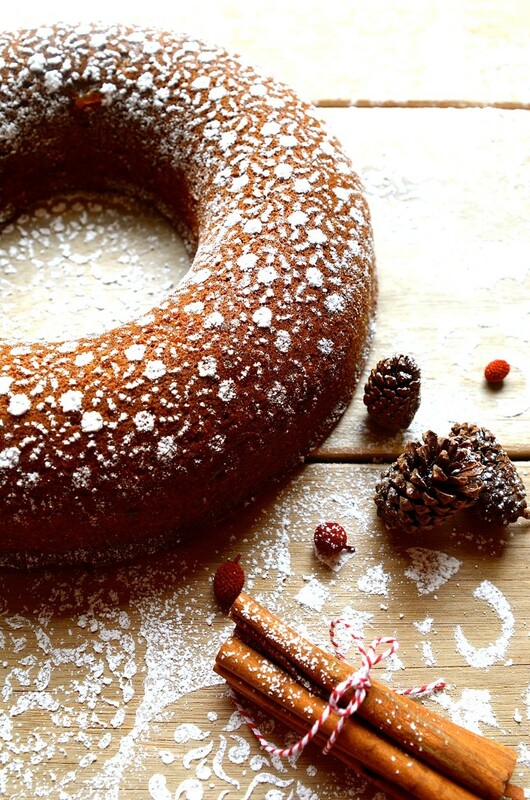 That’s what you can expect from this Gingerbread Bundt. 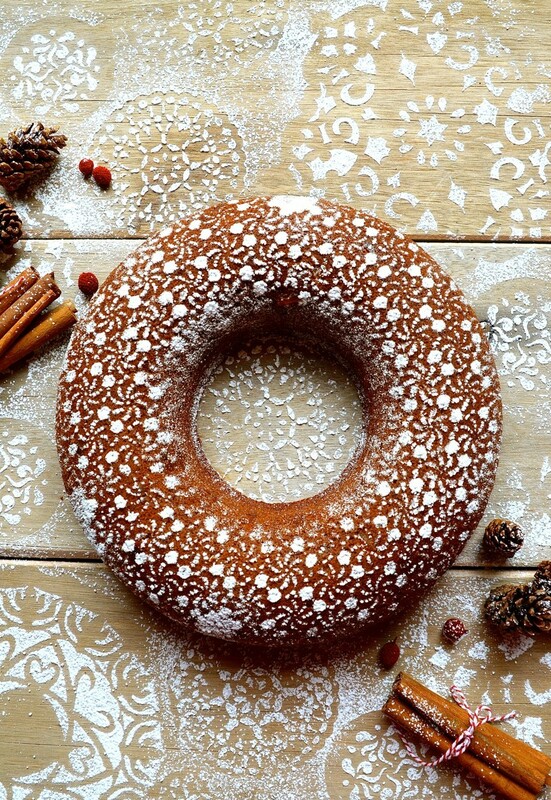 If a traditional fruit cake is not quite your thing, then this bundt might just well be. I love a good Bundt. It’s not flashy or wildly, just honest and simple. It’s also one of the easiest cakes to bake. Bundts recently made a comeback, throwing off their retro image and sauntering in with spectacularly shaped domed tops. A Bundt is essentially a cake with a hole in it. There’s no fussing about with layers, frosting or fillings. It is what it is. Simplicity is sometimes necessary. The only challenge here, is waiting for the cake to cool. Without a sweet buttercream to bolster the taste, it’s essential that the flavourings holds its own. 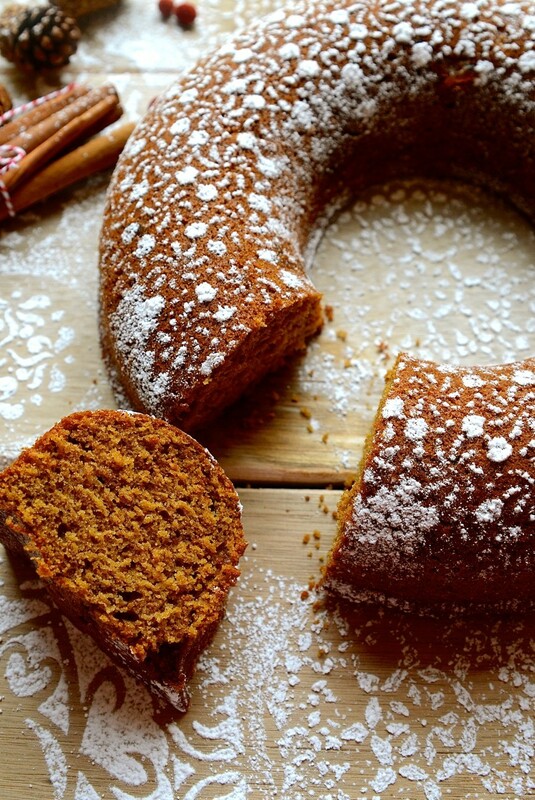 This gingerbread bundt cake is spiced with warming aromatics that smell like Christmas cheer. It also happens to makes a lovely edible Christmas wreathe. 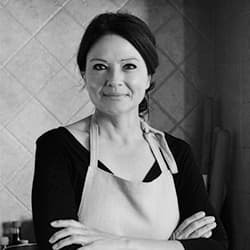 If you’re going to a Christmas ‘bring and share’ dinner, why not bake one to take along for the hostess. A dollop of cream wouldn’t go amiss either. It’ll keep well for several days in an airtight container, although I have a few ideas of turning leftovers into a Christmas trifle. Preheat the oven to 180º C. Spray a Bundt or round cake tin with non-stick baking spray. Beat the sugar, butter and oil together until creamy. Add the eggs, one at a time, beating well after each addition. To the egg mixture, add the syrup and molasses. Whisk until well combined. Sift together the flour, raising agents, salt and spices. Add the flour and coffee to the egg mixture in three alternate stages, starting and ending with the flour. Fold through the ginger pieces and pour into the tin. Tap lightly to settle the batter and bake for 40-45 minutes. Test with a skewer for doneness. Rest the Bundt until it’s cool before unmoulding. If you turn the cake out too soon, it will stick. Once the cake is completely cool, dust with confectioner’s sugar. This cake looks so Devine. I am definitely trying it tonight. Thanks Di. It is Habi and a really simple, everyday kind of cake with no fuss, just fabulous flavour. This cake just melts in my mouth Di. Tasty. Thank u. This is lovely. I love gingerbread cakes. How did you get the powdered sugar to look so fabulous? Thank you Kacey. Me too. I used my Grandmother’s old crocheted doily for the fine lace-like look. It’s works like a charm, especially for unfrosted cakes. Thank you for this recipe. I used it for a Christmas Bake-off competition at work… and won! I couldn’t find molasses and used 1 cup of maple syrup instead. Wow! That’s so impressive Neil. What a wonderful story. I’m sure the maple syrup tasted delicious. Hope 2019 is going to be another successful year of baking.